Accessories with the crest “Futaba Aoi” are available. 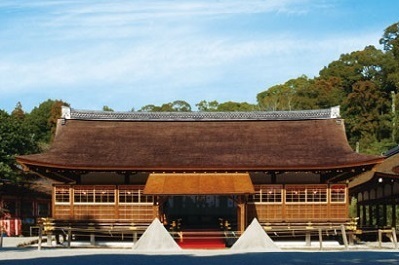 “Kamigamo Shrine” is a world heritage site which is well-known as the oldest shrine in Kyoto. 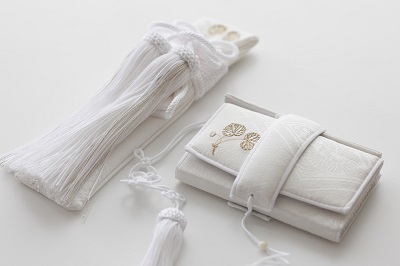 To meet actual requests from our clients, we are offering exclusively designed “Shiromuku (all white kimono)” and “Irouchikake (kimono with colors & patterns)” for the wedding at Kamigamo Shrine. 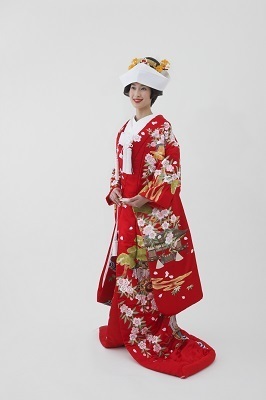 “Original wedding costume for the wedding ceremony at Kamigamo Shrine”. “Irouchikake” is embroidered special patterns like shrine, “Gissha” and “Aoi Festival”, while “Shiromuku” is woven with the patterns of crane and pine tree. Both are ideal for the authentic and traditional wedding. Please come to “OATUSRAE SALON” in LST Kyoto to try these original wedding costume.